The 1971 Ford Capri Scorpio prototype blended sleek pony car lines with edgy hatchback styling for a one-of-a-kind European pony car. The vibrant yellow Ford Capri Scorpio prototype car, shown above, was designed by Bill Fleet. Thick black stripes rest above the car’s air dam, which ran the length of the front fenders, across the doors, above the oversized dummy air scoops on the rear fender wells, and end in a Scorpio emblem logo at the rear of the car. The Capri Scorpio’s roof line featured unusual styling at the rear where it continued out nearly level, and then swooped into an upturned lip before plunging straight down to the bumper. 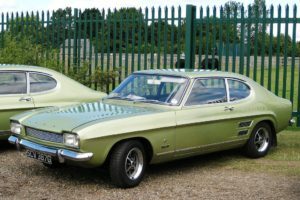 The Ford Capri MK1, shown above, was in production from 1969 through 1974, though it received some restyling in 1970. The Capri did not, however, cease production in 1974, updated versions of the Ford Capri were offered to European markets through 1986. 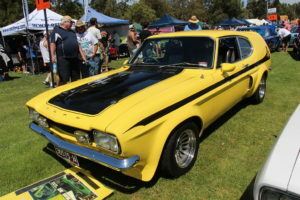 The German-built English Ford Capri pony car featured the long hood and short deck styling found on American pony cars, but instead of the Mustang’s powerful V8 engine, a Cortina engine was dropped into this British classic. The English Ford Cortina is a saloon car that vaguely looks like a Dodge Dart mixed with a Ford Galaxy. Square headlights were featured on most Capri models, and different CID engines were offered as options on models sold in England, Germany, and Australia. In America, the Capri was incorporated into the market under the Mercury umbrella from 1970 through 1994. Be sure to visit the Classifieds page here on the Classic Cars Online US site if you are looking to buy or sell a classic car, car parts, or car-related service.